Extracting building blocks from an alien symbiote, Tony Stark has created the Endo-Sym Armor, a psionically activated suit of liquid smart-metal armor that hardens on connection. He now operates out of San Francisco. Like the bio implies, the Superior Iron Man suit was based on symbiote biology - yes, as in "Venom." That doesn't seem smart, but Tony's nothing if not a risk-taker. The suit is white and black with some blue accents, making it look remarkably un-Stark-like. The figure gets new gloves and a new belt, and while you could display him with his helmet on, Tony Stark being Tony Stark, he figured out a way to create a transparent graphene shield that allowed him to still show his face. This isn't the original Apocalypse - it's a young clone named "En," who went by the supranym Genesis. When the Inversion hit, he turned into an adult... and evil. The figure has the usual thigh and bicep pieces to bulk up the limbs, and a waist extender, but all his specifically Apocalyptic pieces are new molds. That means new boots, new gloves, and a mighty chest cap with an angular collar and a huge A belt buckle. Tubes run from his belt to his gloves, and he's got a massive frown. 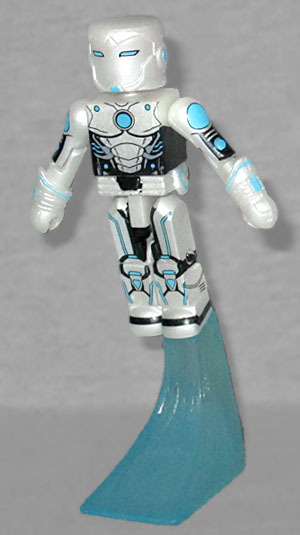 The light blue areas of his design are metallic, while the dark areas are flat. 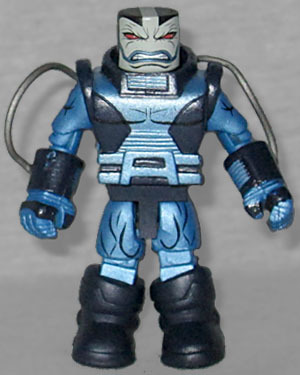 This entry was posted in Art Asylum, Marvel, MMMR and tagged Iron Man, Minimates, X-Men. Bookmark the permalink.